The Flash Fire Mini-Reviews are back with a set of reviews from Todd Cash. Todd is going to wrap up his the Ready-Made Characters series from White Wolf. This is the third time I’ve approached character packages like these, so I won’t retread basic thoughts on these character packages (not much at least). If you’d like these details you can find read up on The Keepers and Slaughterhouse Five. Each of these collections, which are fitted for specific settings (Vampire: the Requiem, Werewolf: the Forsaken, etc. ), run about five dollars (slight differences between titles in price seems mysterious). The Refuse comes first. Promethean:the Created allows for some memorable characters; this quintet illustrates the point perfectly. The Refuse is a group of outcasts who joined each other for companionship and protection. Each member–Dennison 23rd, Gargoyle, Hellas, Worm, and Dove–prove to be some insightful creations. They really have to be since Promethean proves to be such a challenging system. Playing a group of vampires isn’t the same as playing these beings. Vampires are social creatures and, for the most part, can interact with the six billion humans on the planet. With the exception of Hellas, these characters are pariahs who even affect the environment around them should they stay in one place too long. These facts work to generate a fairly unique gaming experience. The layout for this is simple, but plentiful for what is needed. The book is 28 pages and has a border of what looks almost like x-ray photos along the top border (except on pages devoted to characters). The headers are a blurry blue font that I really think looks neat. The icon for this throng is a literal twist to the three-arrow recycling icon. One of the arrows is broken or twisted. I think it would be hard to find a better icon for this group. Avery Butterworth’s artwork is one of the better collections I’ve seen for these character collections. In my earlier reviews, I’ve loved and hated the depictions. Although Dennison 23rd pushes my personal tastes, I think the sketched characters for this supplement are the best thus far. There is a lot of material crammed into this booklet. The format remains the same: an introduction to the group’s formation comes first and is followed by four pages devoted to each character. After that, this booklet works to make sense of such a challenging group of misfits. There is a great amount of Storyteller advice in Refuse, which is always a win with me. Some minor rules are also detailed in order to explain some of the stranger abilities these creatures have. 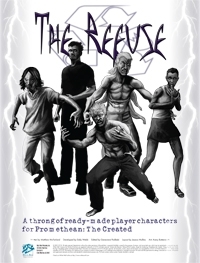 The Refuse is available at the Flames Rising RPGNow Shop. A group of family members happens to share more than just a bloodline. They are all werewolves. Tragedy strikes, taking out some of the members. This leads the Alpha, a girl named Bridgette Byrne who wasn’t hugged enough as a child, to reform the team with a second family. Doubts of leadership, questions of faith and loyalty, and more drive the inter-character reactions in this character package. The layout in Calm Before the Storm smoothly fits its Werewolf base. The fonts are kind of wild and scratchy. Wickedly cool totems are watermarked into the pages. The only aspect that confuses me still is what the border is supposed to be. Because of its color, I feel like its supposed to be tree bark; however, the name of the group keeps me thinking that it’s rain falling on glass. Despite this mystery, it proves to have a great bordering effect. This package’s artwork is a bit strange. On a positive note, the lupine sketches are ferocious and delicious. On the negative side, Bridgette Byrne looks as if she may be a zombie. I’m not sure about the stats on a Zombie Garou, but I’m guessing overkill. For a Werewolf package, I’d like to see two character sketches. One in the human form and one in the Garou form. Face it, these are the two forms players are bound to shift to. The shift does exist as a watermark on the character sheets, which is cool. Also, the four-page character distinction breaks here. Each character gets six pages of attention (the booklet is even a tad bigger at 37 pages). David Hall’s writing considers all the usual questions these packages tend to raise. His five characters have good reason to be together, but enough hidden luggage to summon great in-game interactions. His play support suggests links to some of the SAS games, particularly Parlor Games. One thing Hall did that I found useful in playing these characters with friends is this: he suggests what kind of player might best benefit from each character. It would be harder, though not impossible, to make these distinctions with strangers at a convention. The difficult part would be Tara as you ask the group who would like to be the manipulator seeking an Alpha position. 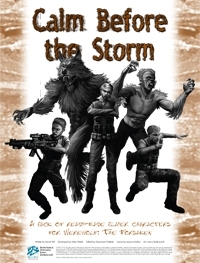 Calm Before the Storm is available at the Flames Rising RPGNow Shop. Jess Hartley’s group of pre-generated characters comes from Changeling: the Lost. She follows the typical road that allows each character to fill a needed spot in the group. For example, the Beast Aslan (the Lion-O chap on the front page) is the team’s muscle. There is nothing wrong with going this course as most players work to create just such a group. It allows the entire group a chance to shine throughout most sessions. These characters, for me, seem to have a bit in common with the Refuse. They are outsiders who are haunted by their past. Sometimes this haunting is literal, such as in Romeo’s case. The layout here looks really nice. The thorn hedge around the pages acts as an awesome border. Various sigils pasted throughout the book look good even though they mostly serve the purpose of eating up dead space in the book. I see no reason why the character write-ups can’t be a little bit longer to off-set this. Perhaps the specific character story seeds could be put with the character, but written as an inspiration for the player rather than the storyteller. This could help players jump into the character a little faster, specially if they are a newbie. Any of White Wolf’s games are daunting for reasons of jargon alone to new players. Avery Butterworth has a way with freaks. I like the Personae’ depictions in this collection. Nicola is my personal favorite while The Hunchback comes in last (but is still visually cool). Jess Hartley’s fantastic writing, particularly at the end of the booklet, helps prime ideas. Her characters, while created for pick-up purposes, have long-reaching goals the suggest long-term use. It doesn’t have to be this way, but the materials are there. She is forced to spend a little too much space on playing these characters with one of them missing, but the decision to create role-based characters causes this. She makes strong connections to the Changeling adventures The Rose-Bride’s Plight and The Fear-Maker’s Promise and suggests solid ways to tie into those adventures. The final two pages are a collection of wild story seeds, probably some of my favorites. 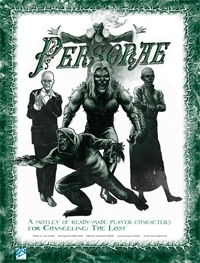 The Personae is available at the Flames Rising RPGNow Shop. Kelley Barnes’ collection of characters almost does something I never expected. Only one of the five characters has any real supernatural ties (he senses dead people). Another character had a brush with it, which is why she can’t sleep without drugs or drink. 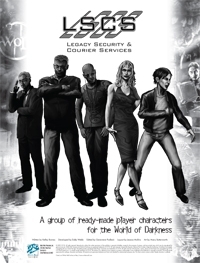 The five characters for Legacy Security and Courier Services fit in to Spycraft or Shadowrun just as easily as they do their ended setting, which is the World of Darkness. They aren’t a Vigil, which the writer covers in a sidebar. 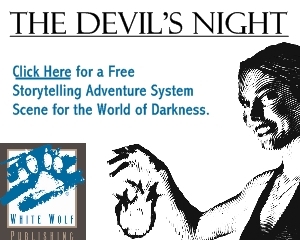 The layout works as in all World of Darkness releases. A collection of partial superimposed images are laid out as the border. In the larger books, the border makes more sense as the photos are distributed throughout the book. The images in this package are not to be found since all the artwork comes from Avery Butterworth’s characters. Nevertheless, the border looks good and has some nice aspects to it (the lonely shadow in the alleyway strikes well with me). I’ve always liked the spattery Saw-like fonts for the World of Darkness and this continues to deliver just that. 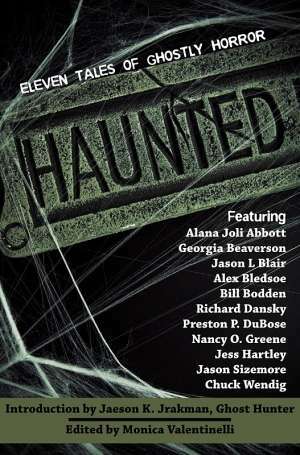 The all-human cast isn’t as odd to me in this collection as it was in Calm Before the Storm. The characters come from all walks of life and are visually distinguished. Peter Sweeney or Morgan Welles are personal favs for me while I’m colder towards Lesley Porter. She just seems a little more frozen than the other four. Barne’s characters run the risk of falling into Hartley’s trap; however, Peter and Lesley are both physically capable. Morgan and Robert can handle social situations. Robert and KayGee have the mental area squared away (KayGee also has a quote that references an 80’s movie, which made me smile). The game works best with all five characters, but the game still works with less. This permits Barnes to writing only two paragraphs on who to take out of the equation in smaller groups. Coming in at twenty-six pages instead of the usual twenty-eight, Barnes uses the final two pages to sprinkle out some story seeds. Several of these seeds link to supernatural elements so you don’t end up playing sessions of The Wire or Alias (although there is nothing wrong with that). LSCS is available at the Flames Rising RPGNow Shop. That does it for this week’s Flash Fire Mini-Reviews series. Stay tuned for more mini reviews of our favorite horror & dark fantasy books, games, comics and more here at Flames Rising. As always, thanks for your insightful reviews, Todd! I’ve picked up a few of these for my games (LSCS & The Keepers), they are indeed time savers and pretty swank idea’s.